CLEVELAND, Ohio, Feb. 4 (SEND2PRESS NEWSWIRE) — Mr. Ray Michaels, founder of Localization, LLC, has recently announced that despite sluggish economy performance, the demand for translation and language services has held up. As the economy recovers, companies once again are looking to reach new customers. Some companies are starting to increase their exports, others are making efforts to broaden their client base domestically; in both cases, the companies are targeting non-English speaking customers. And for Localization, LLC, that’s music to their ears. Localization, LLC is a Cleveland based firm that provides such language services as translation, interpretation, voice over and dubbing. The company works with over 50 language combinations. 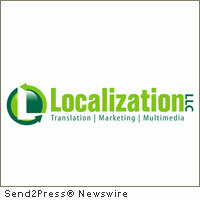 Localization, LLC was founded in 2007 by Ray and his wife. Since then, the company has worked with leading Northeast Ohio businesses as well as companies in San Francisco, London and New York. The main source of company’s business comes from translating manuals, legal cases, scientific works, financial reports, patents and personal documents. Mr. Michaels also adds that translation has evolved into a very diverse industry with services that may not come to mind right away when thinking of translation. That’s why in addition to translation and interpretation, one will also find that Localization, LLC offers such services as transcription of foreign languages, voice over and dubbing. “Fortunately, I am not the one man company,” laughs Ray. More information about Localization, LLC and its services is available at www.localizationllc.com or by calling 216-785-5252.